Although the Nikon 1 S1 is now the entry-level model, the J3 is the smallest and lightest Nikon 1 system camera so far – but only just. Nikon’s claim that the J3 is the smallest CSC has the stipulation ‘with CX-format sensor or larger’. The camera measures 101×60.5×28.8mm, so it can virtually fit in the palm of your hand, and it weighs a mere 244g with battery and memory card inserted. 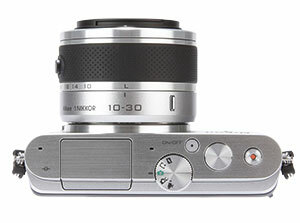 The top and front of the camera are finished with a slick, brushed-metal effect. This finish is more professional-looking than the smooth, shiny, plastic-looking surface of the J2. A few buttons have been moved around, including the shooting-mode dial, which is now on the top-plate. The result is a much less cluttered rear. However, I am disappointed there is no thumb grip, given that the rear of the camera is smooth and can prove to be slippery. Instead, there is a raised edge to rest the thumb against, which is less effective. Like its J2 predecessor, the J3 does not have a viewfinder or hotshoe. It does, however, include a built-in flash, which has a redesigned crane mechanism. The J3 has a respectable start-up time, with the camera ready to shoot in just under 3secs. The on/off switch can be skipped when using a Nikon 1 lens, because rotating the lens from its locked position starts up the camera. Battery life is modest, especially with the camera’s power-hungry shooting modes. While testing the camera, on most days I was restricted to half a day’s shooting before needing to recharge the battery. Most images are processed speedily and do not slow down the use of the camera, which is impressive given that some of the modes are data hungry. However, there are shooting modes, including motion snapshot and some creative modes such as night landscape, that take more than 10secs to process. The in-camera rating system works well. When in playback, pressing the F button on the rear control wheel accesses the 1-5 star rating system. I would like to see this sort of set-up introduced in Nikon DSLRs. Overall, the camera is well designed for simple point-and-shoot operation. However, getting one’s head around the shooting modes is less straightforward. A mode such as slow view is both difficult to handle and surplus to requirements, given the easier to use smart photo selector.